efore you lash out at me with the choicest phrases from Kohli’s own colourful lexicon, hold on. Like you, I am a Virat Kohli fan. It’s nearly impossible to not be: He is a dynamic cricketer, arguably the best batsman of all time, and certainly, in my opinion, the best limited-overs batsman of our times. But, does that make him a great captain? I have my reservations, at least as far as the Indian Premier League is concerned. The numbers don’t lie either: As of Sunday, Royal Challengers Bangalore faced its sixth consecutive defeat in the 2019 edition of IPL. Six seasons ago, Kohli became the captain of Royal Challengers Bangalore, but his IPL trophy cabinet is still empty. Had any other captain been unable to maximise his players’ potential over so many years, his job would have been on the line. Remember Gautam Gambhir? Despite leading Kolkata Knight Riders to two IPL wins, he had to step down as captain and then also drop himself from Delhi’s playing XI, after just a handful of failures in IPL last year. It’s no wonder then, that it was Gambhir who offered an insight into Kohli’s predicament. “Ultimately a captain is as good as his record,” he said, adding that Kohli is “very lucky” to be retained as the RCB captain despite repeated failures. Gambhir’s arguments are not without substance. Apart from making it to the final playoffs in 2016, Kohli’s RCB have often found themselves in the bottom half of the points table. Under his captaincy, the team has finished last, second-last, and third-last. “Ultimately a captain is as good as his record,” he said, adding that Kohli is “very lucky” to be retained as the RCB captain despite repeated failures. RCB have looked unnerved under Kohli. Take, for instance, the randomness of their opening combination. It was Kohli who opened the batting along with Parthiv Patel in the first match this season. Then, Moeen Ali took over the role alongside Patel, who was later swapped with Shimron Hetmyer. After a few games, the team switched to their initial combination: Kohli opening the batting along with Patel. These knee-jerk changes betray the extent of the team’s inconsistencies. And, Kohli’s inability to take decisions and stick with them might be his greatest undoing as captain during IPL, a format that demands clarity of thought from its leaders. Kohli’s statistics as an Indian skipper however, paint a completely different picture. After leading the Indian ODI side in 68 matches, Kohli boasts of a win percentage of close to 75 per cent – the most by any Indian captain who has led the side for more than 10 matches. Even the stats of two of the Indian cricket team’s greatest captains – MS Dhoni (60 per cent) and Sourav Ganguly (54 per cent) – pale in comparison. However, he hasn’t been able to find even a semblance of his international success in the IPL. After leading RCB for 100 matches, Kohli’s average win percentage is a shoddy 45 per cent. It’s not to suggest that Kohli doesn’t have it in him to be a good captain. 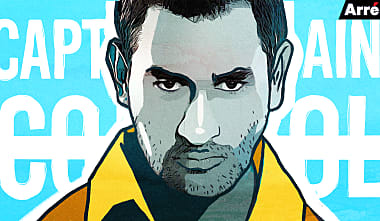 But maybe, it’s time to entertain the idea that being a great IPL captain isn’t in him. It won’t be the end of the world. Even Sachin Tendulkar, the God of Cricket, didn’t warm up to captaincy. After leading India in 73 matches, his disappointing win percentage of 35 per cent ultimately led to him stepping down. His predicament was similar during his IPL run: While Rohit Sharma has three trophies after captaining Mumbai Indians in 98 games, the Master Blaster was without one after 55 matches. After leading RCB for 100 matches, Kohli’s average win percentage is a shoddy 45 per cent. There comes a point while solving a jigsaw puzzle when you just cannot conjure up the correct combinations, regardless of how much effort and time you invest. When such a situation arises, there’s no other choice but to start from scratch with reignited energy. Just like Kolkata Knight Riders did when Sourav Ganguly, an inimitable captain, failed to translate his IPL captaincy into wins. It ultimately resulted in Gambhir assuming captaincy in 2011 and brought KKR two IPL triumphs within four years. It might just be the thing that could turn the fortunes of RCB. The need of the hour is fresh energy around the camp, and that is hardly possible without revamping the management – which includes the captain. Like this piece on Virat Kohli notes, “Here’s the thing about cricket. Great squads don’t win matches; the right playing eleven does.” And in case anyone forgot, the captain is the most significant member of that playing eleven. As the World Cup approaches, we need our skipper to enter the arena with a lot of positivity. That is unlikely to happen if RCB’s track record is anything to go by. In the IPL, a format where Kohli doesn’t have the luxury of receiving MS Dhoni’s calming guidance on field, it might do him well to realise that right now and step down.